The RESPECT Clinic opened on October 3, 2001. The purpose of this clinic is to provide confidential testing and treatment for sexually transmitted diseases. The RESPECT Clinic is open on Monday nights from 5:30-7 PM. The visit and routine STD services provided at RESPECT Clinic are free. The clinic provides a unique opportunity for students to gain practical experience in interviews, physical exam, and diagnosis pertaining to sexual health. 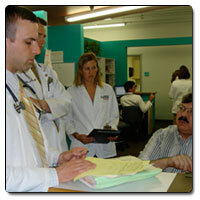 Volunteer physicians and nurse practitioners are there to assist and supervise the students.